are my favorite 18 holes. Cypress Point is my favorite golf course as of right now, and I don't see that changing any time soon. And the 16th hole at this amazing golf course is my favorite hole on the course. Seems fitting that it should be my favorite hole in the world. First off, the beauty is unimaginable. Secondly, hearing the ocean roaring in the background as the waves smash into the rocks makes the setting surreal. And then add in a par 3 that takes a driver to reach the green, but you have the option to use another route to get to the green. Put it all together and you've got the greatest golf hole in the world. 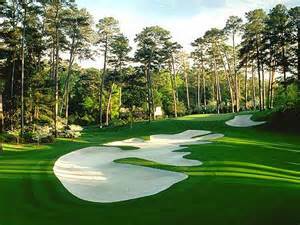 One of the most famous stretches of holes in the world of golf is "Amen Corner" at Augusta National. The best holes of that stretch is the par 5 13th. It has a unique angle off the tee, which allows you to challenge the hole for eagle...but risk hitting it into creek. Or you can play it safe out right. Rae's Creek fronts the green and makes all approaches challenging. And then you are on the green...and the fun really starts! Incredible golf hole!! have new things to try. This hole embodies all that is needed to make a par 4 great. This par 4 has it all...beauty, history, strategy, and it demands execution. The centerline bunker, The Mackenzie Bunker, is the focal point of the hole. But the steep drop offs around the green and the deep bunkers are what really should be grabbing the golfer's attention. Truly a wonderful golf hole. The newest course at the world class Dismal River Golf Club in Mullen, NE is the Red Course, which was designed by Tom Doak. The entire course embodies the principles of strategic golf. Perhaps no hole is more strategic than the epic 4th hole. A centerline bunker dominates the golfer's view off the tee and wind confounds the decision making process regarding how much to bite off on that tee shot. And ridges, slopes, and fall offs further complicate matters. Decisions need to be made prior to every shot and execution of those shots are required until the ball is safely in the cup. Pebble Beach might have the most thrilling stretch of holes I've ever played. And the par 5 6th hole, begins that thrill ride. 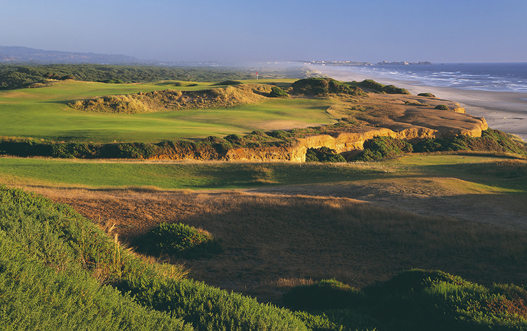 The tee shot is hit to a sunken fairway that has the ocean roaring over the cliffs to the right. The approach is to a severely elevated and blind green surrounded by the ocean and rocky cliffs. WOW!! raised green surrounded by daunting bunkers. All with the stunning Oceanic backdrop. WOW! hole. Now THAT is golf!!! This short par 4 is no pushover, despite the fact that you might be able to drive the ball damn near on the green. But, the heavily contoured fairway and greenside chipping areas might not make that play ideal. Angles on this hole are important, as well as pin position, and the width of the fairway opens up all angles and options. This hole is never ending fun. Heck, you could even play this hole with nothing but a putter! even from their you better execute. away from your approach. Choose wisely off the tee and strike it crisp on your approach or pay the price! The Old Course, attacking the hole from the center of the fairway may not be the wisest choice! As I mentioned previously, Cypress is my favorite course. And the course is really good until you reach the 13th hole...and then it shifts into overdrive and becomes the greatest of the great. So, to me, the par 4 13th is the gateway to greatness at Cypress Point. traverse some severed bunkers (more like gorges) on your way to that beautiful vista. hickories and era appropriate balls as the course was built in the early 1900's. Now that is a challenge!!!! My, oh my...Royal County Down is as good a golf course as there is on the planet. Frankly, there are 3 or 4 holes that could be on this list...but I'm going with the 15th hole. It is a long, uphill par four with some incredible challenge off the tee, on the approach, and at the green. It is one tough golf hole and all the while you are surrounded by wonderful vistas. Wow! A round at Royal Portrush is wonderful and the 5th hole is the highlight of the round for me. Stunning views in all directions and a tough decision to make off the tee...how much do you try to challenge this hole? Great golf hole with stunning views...win/win. into some deep and nasty bunkers. A word of advice, hit the green on your tee shot! !